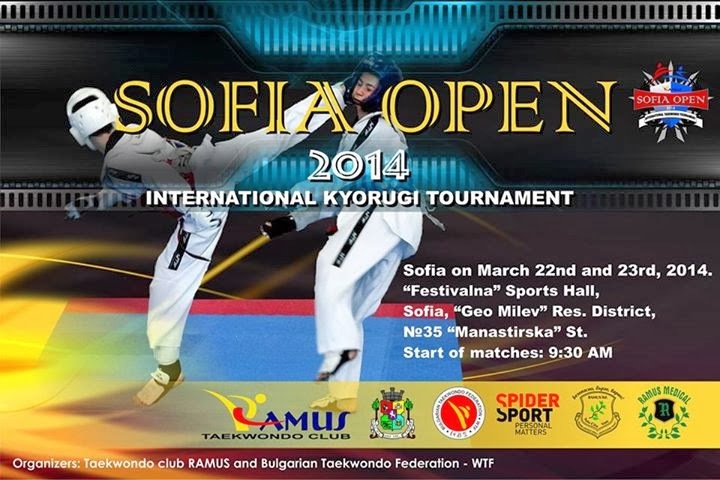 INTERNATIONAL KYORUGI TOURNAMENT on March 22nd and 23rd, 2014. Deadline for entry of new competitors: by the end of 14 March 2014. NO new applications wibe accepted after the deadline. Deadline for editing already entered competitors (such as moving an athlete to a different weight class): by the end of 16 March 2014. Place: “Festivalna” Sports Hall, city of Sofia, “Geo Milev” Res. District, №35 “Manastirska” St.
MEETING At 9:00 on 22nd and 23rd March 2014 at the “Festivalna” Sports Hall. Each athlete can participate in only one class (“A” or “B”). Athletes born in 1997 can participate in only one of the following age groups: “Juniors” or “Seniors”.